Metoprolol is a cardioselective β1-adrenergic antagonist that is used for the treatment of acute myocardial infarction, heart failure, angina pectoris and mild to moderate hypertension. It may also be used for tachyarrhythmias and supraventricular arrhythmias and prophylaxis for migraine headaches. Metoprolol is a synthetic pharmaceutical drug. Why is Metoprolol prescribed for? Metoprolol can be used alone or in combination with other drugs for the treatment of high blood pressure. High blood pressure is a common condition that can cause damage of blood vessels, brain, heart, kidneys and other parts of the body, if it is not treated. These damages may cause serious health conditions such as heart disease, heart failure, a heart attack, stroke, arrhythmias, kidney failure, glaucoma, and other problems. In addition with pharmacological therapy, lifestyle changes will also help to control blood pressure. These changes include a diet, low in fat and salt, not smoking, maintaining a healthy weight, exercising (at least 30 minutes most days), and using alcohol in moderation. It is also used to prevent angina, a pain in chest, and to improve survival after a heart attack. Metoprolol is also used in combination with other drugs to treat heart failure. It may be used to treat tachyarrhythmias and supraventricular arrhythmias and for the prevention of atrial fibrillation relapse in controlled-release or extended-release dosage form. Metoprolol is also used sometimes, as a non-specific off-label therapy to prevent migraine headaches. Metoprolol has selectivity in blocking the beta1 receptors in the heart; metoprolol is also prescribed, off-label for relieving the symptoms of anxiety disorders such as generalized anxiety disorder and social anxiety disorder. It can be also used in adjunct treatment of hyperthyroidism. Metoprolol belongs to the class of organic compounds known as tyrosols and derivatives. These compounds contain a hydroxyethyl group that is attached to the C4 carbon atom of a phenol group. Metoprolol has a very low melting point, the tartrate’s is around 120 °C (248 °F), and the succinate’s around 136 °C (277 °F). Therefore, metoprolol is always manufactured in a salt-based solution, because drugs with low melting points are difficult to work within a manufacturing environment. The free base exists as a waxy white solid, while the tartrate salt is finer crystalline material. Inactive Ingredients in tablets are usually: lactose monohydrate,colloidal silicon dioxide, hydroxypropyl methylcellulose, microcrystalline cellulose, magnesium stearate, polyethylene glycol, sodium starch glycolate, polysorbate, povidone, talc and titanium dioxide. Metoprolol is a cardioselective competitive antagonist of beta-1 adrenergic receptor that antihypertensive properties devoid of intrinsic sympathomimetic activity. This substance selectively antagonizes beta-1 adrenergic receptors in the myocardium, reducing the force and rate of myocardial contraction and leading to a reduction in cardiac output. This drug may also reduce the renin secretion with subsequent reduction of angiotensin II levels, preventing the vasoconstriction and aldosterone secretion. At higher doses and plasma concentrations, metoprolol can also inhibit beta-2 adrenergic receptors that are located in the bronchial and vascular musculature. (4) Reduction of orthostatic reflex tachycardia. Antihypertensive effects of beta-blocking agents have not been fully revealed. However, there are several possible mechanisms that have been proposed: (1) competitive antagonism of catecholamines at peripheral adrenergic neuron sites, can lead to decreased cardiac output; (2) a central (brain) effect leading to reduced sympathetic outflow to the periphery; and (3) renin suppression activity. 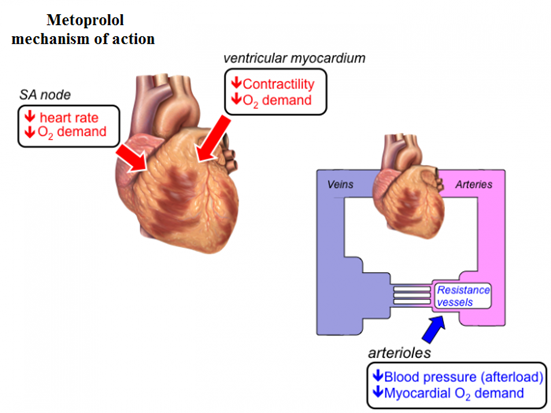 Metoprolol blocks catecholamine-induced increases in heart rate, velocity and level of myocardial contraction, and lower the blood pressure. At any given level of effort, Metoprolol can reduce the oxygen requirements of the heart, therefore making it useful in the long-term treatment of angina pectoris. Metoprolol does not contain intrinsic sympathomimetic activity, and membrane-stabilizing activity is detectable only at much higher doses than required for beta antagonism. Animal and human studies have been shown that Metoprolol can slow the sinus rate and decrease AV nodal conduction. Initial dose: 100 mg orally each day in single or divided doses. Maintenance dose: from 100 to 450 mg orally per day. Dose may be increased at weekly, or longer, intervals. There are no studies for the doses above 450 mg per day. Lower once-daily doses may not maintain full effect by day; more frequent or larger daily doses may be needed. Beta-1 selectivity weakens when the dose is increased. There are no studies for the doses above 400 mg per day. Initial dose for Metoprolol tartrate immediate release tablets: 50 mg orally twice per day. Increased doses can significantly slow the heart rate. Doses above 400 mg per day have not been studied. Patients who appear not to tolerate the full early treatment, patients with contraindications to treatment during the early phase of suspected or definite myocardial infarction and patients in whom the doctor wants to delay therapy for some reason should be started on 100 mg orally two times a day day as soon as their clinical condition that allows. Therapy should be continued for at least 3 months. There is no information about efficacy beyond 3 months. Initial titration difficulty should not preclude later attempts to introduce this drug. Many patients with high blood pressure will not notice any signs of the problem and many of them usually feel normal. It is very important that patients take their medicine exactly as their doctor directed and that they keep their appointments with their doctor even if they feel well. It is important to know and remember that this medicine will not cure high blood pressure, or any other heart disease which is indicated for, but it does help controlling them. Patients must continue to take it as directed if they want to lower their blood pressure and keep it down. In most cases they may have to take antihypertensive medicine for the rest of their life. If high blood pressure is not treated and controlled, it can cause serious health problems. When discontinuing metoprolol that is used for a long period of time, particularly in patients with ischemic heart disease, it is necessary to gradually reduce the dose due a period of 1 to 2 weeks and monitor the patient. If after discontinuation of the therapy, angina attacks worsen or acute coronary insufficiency develops, patients need to promptly resume the therapy, at least temporarily, and take other appropriate measures for the treatment of unstable angina. Dose adjustments: For treatment of hypertension and angina, when switching from immediate release to extended release, total daily dose should be used. Renal dose adjustments: No adjustment recommended. Liver dose adjustments: Initiate at low doses and titrate gradually according to effective response. Absorption: For immediate release metoprolol the estimated oral bioavailability is about 50% because of pre-systemic metabolism which is saturable, so if the dose is increased it can lead to non-proportional increase in the exposure. Distribution: Metoprolol is extensively distributed. In plasma, about 10% of metoprolol is bound to serum albumin. This drug can cross the placenta and it can be also found in breast milk. Metoprolol can also cross the blood brain barrier, and it is not a significant substrate for P-glycoprotein in the brain. 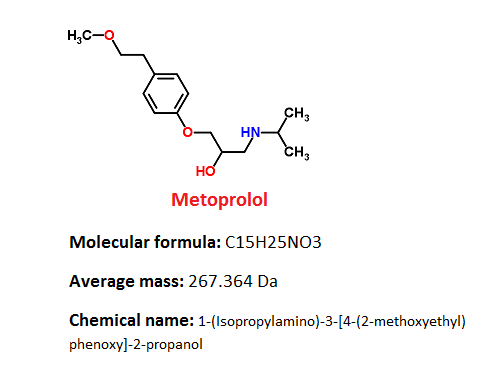 Metabolism: Metoprolol is predominantly metabolized by CYP2D6 enzyme. After oral administration, it exhibits stereoselective metabolism, because metoprolol is a racemic mixture of R- and S- enantiomers. CYP2D6 enzyme is absent in about 8% of Caucasians and about 2% of most other populations. Poor CYP2D6 metabolizers can exhibit higher blood concentrations of metoprolol comparing to extensive metabolizers with normal CYP2D6, thereby decreasing metoprolol cardioselectivity. Elimination: Elimination of metoprolol is mainly by the liver biotransformation. The half-life of metoprolol is about 3 to 4 hours; however in poor CYP2D6 metabolizers the half-life may be 7 to 9 hours. Almost 95% of the dose can be recovered in urine. Geriatric patients: Higher plasma concentrations of metoprolol can be expected in geriatric population as a result of decreased hepatic blood flow and a poorer metabolism of the drug. Renal impairment: The half-life and systemic availability of metoprolol in patients who have renal failure do not clinically significant differ from those in normal subjects. Hepatic Impairment: Hepatic impairment may impact the pharmacokinetics of metoprolol since the drug is primarily eliminated by hepatic metabolism. Animal studies have found increased fetolethality, postimplantation loss and decreased neonatal survival after metoprolol administration. However, there are no controlled data in human pregnancy. US FDA pregnancy category C: Reproduction studies on animals have shown an adverse effect on the fetus and there are no well-controlled and adequate studies in humans, but potential benefits may warrant use of the drug in pregnant women despite potential risks. In United States: This drug can be used during pregnancy only if patients clearly needed. In Australia and United Kingdom: Use is not recommended unless benefit outweighs risk. If this drug is used during pregnancy, the lowest possible dose should be taken and discontinued at least 2 to 3 days before expected delivery. Studies have found that an infant would receive a dose of less than 1 mg of drug by consuming 1 L of breast milk a day. In Australia and United Kingdom: Use of metoprolol during breatfeeding is not recommended unless benefit outweighs risk. In the US: Caution is recommended, because it can be excreted into human milk in small amounts. Patients should tell their doctor or pharmacist if they are allergic to metoprolol, or other drugs such as atenolol (Tenormin, in Tenoretic), acebutolol (Sectral), carvedilol (Coreg, Coreg CR), betaxolol, bisoprolol (Zebeta, in Ziac), esmolol (Brevibloc), nadolol (Corgard, in Corzide), sotalol (Betapace, Betapace AF, Sorine), pindolol, propranolol (Inderal, Inderal LA, Innopran XL, in Inderide), labetalol, timolol, any other medications, or any metoprolol ingredients in tablets. Patients should tell their doctor or pharmacist if they are taking any other prescription and nonprescription medications or vitamins, nutritional supplements, and herbal products. Patients should mention any of the following: fluoxetine (Prozac, Sarafem, Selfemra, in Symbyax), clonidine (Catapres), bupropion (Aplenzin, Forfivo, Wellbutrin, Zyban), cimetidine, terbinafine (Lamisil), diphenhydramine (Benadryl), ranitidine (Zantac), hydroxychloroquine, paroxetine (Brisdelle, Paxil, Pexeva), propafenone (Rythmol), quinidine, reserpine, ritonavir (Norvir, in Kaletra), and thioridazine. Their doctor may need to change the doses of these medications or monitor carefully for side effects. Patients should tell their doctor if they have a slow heart rate, problems with blood circulation, heart failure, or pheochromocytoma (a tumor that may cause high blood pressure and fast heartbeat). Patients should tell their doctor if they have or have ever had asthma or other lung diseases; diabetes; heart or liver disease; severe allergies; or hyperthyroidism. Patients should tell their doctor if they are pregnant or plan to become pregnant, or if they are breastfeeding. Patients should call their doctor if they become pregnant while using metoprolol. If patient is going to have surgery, including dental surgery, patient needs to tell the doctor or dentist that he/she is taking metoprolol. Metoprolol may make patients drowsy. They should not drive a car or operate machinery until they know how this medication affects them. This medication should be kept in the container it came in, tightly closed, and out of reach of children. It should be stored at room temperature and away from excess heat and moisture (not in the bathroom). Any medication that is outdated or no longer needed should be thrown away. If physician prescribes a low-salt or low-sodium diet, patients should follow these directions carefully. The table below shows the incidence of side effects after metoprolol administration in recommendable doses. The incidence can be increased if this drug is overdosed. If you experience any of these symptoms, call your health care provider immediately. Metoprolol may cause other side effects also. You should call your doctor if you have any unusual problems while taking this medication. You should take the missed dose as soon as you remember it. However, if it is almost time to take the next dose, skip the missed dose and continue your regular dosing schedule. Never take a double dose to make up for a missed one. Catecholamine-depleting drugs: Catecholamine-depleting drugs (such as reserpine) can produce an additive effect when given together with beta-blocking drugs or monoamine oxidase (MAO) inhibitors. These drugs taken together may cause bradycardia, vertigo, syncope, or postural hypotension. In addition, possibly important hypertension may occur up to 14 days after following discontinuation of the concomitant administration with an irreversible MAO inhibitor drug. Digitalis glycosides: Together digitalis glycosides (such as digoxin) and beta blockers can slow atrioventricular conduction through the heart and decrease heart rate causing serious bradycardia. Heart rate and PR interval have to be monitored. Calcium channel blockers: Concomitant usage of beta-adrenergic antagonist and calcium channel blocker (verapamil, diltiazem) may produce an additive reduction in myocardial contractility because of negative chronotropic (heart rate) and inotropic (heart contraction) effects. General Anesthetics: Some inhalation anesthetics may amplify the beta blocker cardiodepressant effect. CYP2D6 Inhibitors: The plasma concentration of metoprolol may be increased by potent inhibitors of the CYP2D6 enzyme which would mimic the pharmacokinetics of CYP2D6 poor metabolizer. High plasma concentrations of metoprolol can decrease its cardioselectivity effects. Potent inhibitors of CYP2D6 enzyme are: antidepressants such as fluoxetine, paroxetine, sertraline, fluvoxamine, clomipramine, bupropion, and desipramine; antipsychotics such as haloperidol, thioridazine, chlorpromazine, fluphenazine, antiarrhythmics such as quinidine or propafenone; antiretrovirals drugs such as ritonavir; antihistamines such as diphenhydramine; antimalarials such as hydroxychloroquine or quinidine and antifungals such as terbinafine. Hydralazine: If metoprolol is used together with hydralazine, this drug may inhibit presystemic metabolism of metoprolol leading to increased concentrations of metoprolol in blood, and higher risk of side effects. Alpha-adrenergic agents: Antihypertensive effect may be potentiated if alpha-adrenergic blockers such as alpha-methyldopa, guanethidine, betanidine, reserpine, or clonidine are used together with beta blockers. Beta- adrenergic blockers may also potentiate the postural hypotension of the first dose of prazosin by preventing reflex tachycardia. Opposite, beta blockers may also potentiate the hypertensive response after withdrawal of clonidine in patients receiving concomitant therapywith clonidine and beta-adrenergic blocker. Ergot alkaloid: Concomitant administration with mtoprolol may amplify the vasoconstrictive effects of ergot alkaloids. Dipyridamole: Administration of a beta-blocker should be withdrawn before dipyridamole testing, with careful monitoring of heart rate following the dipyridamole injection. Major Surgery: If metoprolol is used for a long period of time, it should not be withdrawn before a major surgery; however, the weakened ability of the heart to respond to reflex adrenergic stimulation may increase the risks of surgical procedures and general anesthesia. Diabetes and Hypoglycemia: Metoprolol effects can mask tachycardia which normally occurs with hypoglycemia, so diabetics may fall in hypoglycemia without knowing it. Other manifestations such as sweating and dizziness may not be affected. Pheochromocytoma: If metoprolol is used at the beginning of pheochromocytoma attack, it should be given together with an alpha blocker, and only after the alpha blocker has been initiated. In the setting of pheochromocytoma, administration of beta blockers alone has been related with a paradoxical increase in blood pressure because of the attenuation of beta-stimulated vasodilatation in skeletal muscle. Thyrotoxicosis: Metoprolol effects may mask certain clinical signs of hyperthyroidism such as tachycardia. Abrupt withdrawal of beta blockade should be avoided, because it might precipitate a thyroid storm. Cardiac Failure: Beta blockade carries the potential risk of depressing myocardial contractility function and exacerbating or precipitating minimal cardiac failure. Hemodynamic status of the patient should be carefully monitored during metoprolol administration. If heart failure occurs, metoprolol should be discontinued. Bradycardia: Metoprolol decreases sinus heart rate in most patients. This decrease is greatest among patients with high initial heart rates and least among patients with low initial heart rates. If the sinus rate decreases to less of 40 beats per minute, atropine in doses of 0.25 to 0.5 mg should be given intravenously. Metoprolol should be discontinued if treatment with atropine is not successful and cautious administration of isoproterenol or cardiac pacemaker installation should be considered. AV Block: Metoprolol reduces AV conduction in heart and may produce major first-, second-, or third-degree heart block. Acute myocardial infarction also produces heart block. If heart block occurs, metoprolol should be discontinued and atropine (0.25 to 0.5 mg) should be administered intravenously. Metoprolol should be discontinued if treatment with atropine is not successful and cautious administration of isoproterenol or cardiac pacemaker installation should be considered. Hypotension: If hypotension occurs, metoprolol should be withdrawn, and the hemodynamic status of the patient and the level of myocardial damage should be carefully assessed. Appropriate therapy with positive inotropic agents, fluids, balloon counterpulsation, or other treatment modalities should be instituted. Your pharmacist or health care provider can provide more information about metoprolol.